Quick update on Record (REC). Summary: A lacklustre set of results in which the board remained optimistic of further progress — but where new clients were still nowhere to be seen. This statement was particularly irritating due to higher-than-expected staff costs and commentary about an ‘increased’ dividend. However, at least my earnings guess has not changed. One day I trust REC’s currency strategies will have their day in the sun, but until then I must content myself with a useful 5%-plus yield and dreams of what could be. I continue to hold. These were a somewhat frustrating set of results. True, revenue did gain 3% — or 9% if you ignore movements associated with the group’s small investment funds. However, REC’s earlier updates had already signalled diminishing client assets under management, with today’s results confirming effective client AUM had dropped from $55.4bn to $53.3bn during the six months. Revenue therefore is now likely to decrease — at least in the near term. Sadly, today’s results did nothing to suggest an immediate about-turn for client AUM. Instead, REC admitted its currency strategies had been adversely affected by the recent “uncertainty and volatility” in financial markets. REC also gave the now familiar management commentary about a “high level of interest shown in currency-management strategies”. As investors apparently debate the prospect of rising base rates, such interest in REC’s strategies remains just that — interest — and reluctant to convert into actual mandates. For what it is worth, REC is “optimistic about further progress” in the second half. These results showed operating profit down 8% after a 10% wage hike announced in June came into effect. I had assumed REC’s wage bill would now be £6.6m a year (that is, a 10% increase on the £6m paid to staff during 2015). However, wages for the first half were £3.5m, which suggest a £7m bill for 2016. I must admit, it is a tad galling for shareholders to fund a 10% wage rise so the business can “remain competitive” — when the business itself has actually trod water for some time now. I would like to think with less revenue on the horizon, the board might see fit to reduce the wage bill by reducing the headcount. Another niggle in the results small-print was the fact management fees for the group’s Currency for Return product had dropped from 16 to 15 basis points. The reduction does not sound much, but it continues the ongoing erosion seen since 2011 — when the product’s fees were 26 basis points! I was annoyed by REC’s narrative on the dividend. 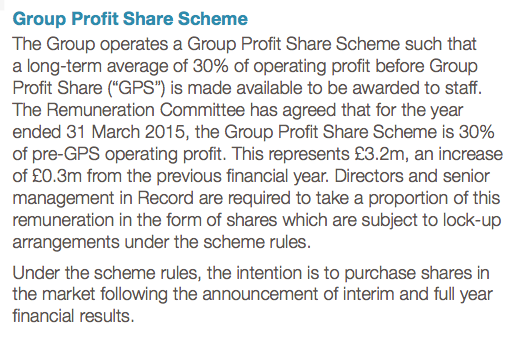 You see, the results headlines indicated a 0.825p per share payout versus 0.75p per share last time. What’s more, the chief exec’s introduction referred to “increasing the interim dividend”. These results did carry a glimmer of good news. 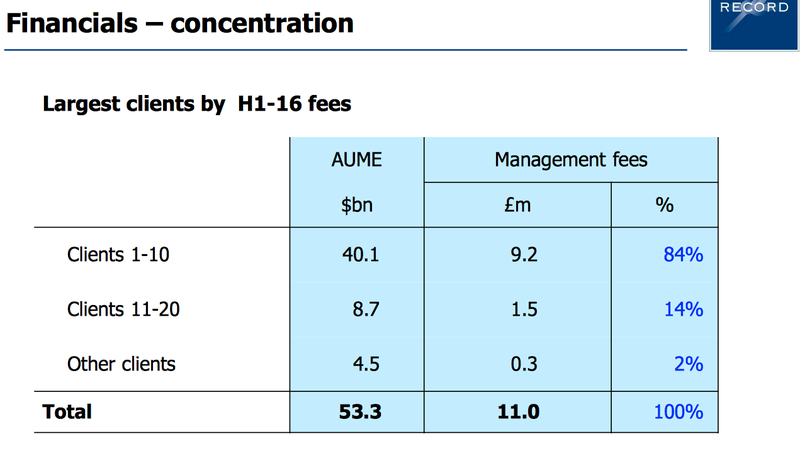 REC had previously said it had lost a £900m Dynamic Hedging mandate. It turns out this mandate has in fact been converted into a lower-margin Passive Hedging mandate on a “somewhat reduced scale”. If that “somewhat reduced scale” means the mandate has been halved to £450m, then I reckon fees from this client could drop 90% after the conversion. That’s a substantial decrease, but it is better than the 100% drop I had assumed. Plus the client remains a client and — you never know — could one day be converted back to the original higher-margin fees. REC remains dependent on a handful of large customers. The 2015 annual results showed five clients representing 58% of total revenue and this first half witnessed the concentration increase to 61%. All five clients contributed at least 10% to the top line. If REC ever signs up more clients, then the earnings possibilities here could be outstanding. During what the group described as a “challenging period”, operating margins were still a super 31% while cash and investments were maintained at a healthy £30m (13.6p per share). Here are my updated calculations. To start off, I’ve based my client AUMe figures from this post-Q2 update and not bothered to add back any revenue from the aforementioned “somewhat reduced scale” client loss. I then applied the margin fee rates disclosed in today’s results and converted the USD fees into GBP at £1:$1.51. I’ve had to increase staff costs from £6.6m to £7m, while other costs remain the same as before. The bonus pool remains at 30%. After standard 20% tax, my sums suggest earnings could be £4.1m or 1.86p per share — identical to the 1.86p per share I had projected earlier. It seems the extra staff costs have been offset by higher fees earned via a stronger USD. REC’s market cap at 30p is £66m. Adjusting that for net cash and investments of £30m and regulatory capital requirements of £8.8m, I make REC’s enterprise value to be roughly £45m or 20p per share. Then dividing the enterprise value by my maintained 1.86p per share earnings guess, the P/E for the underlying business comes to 11. 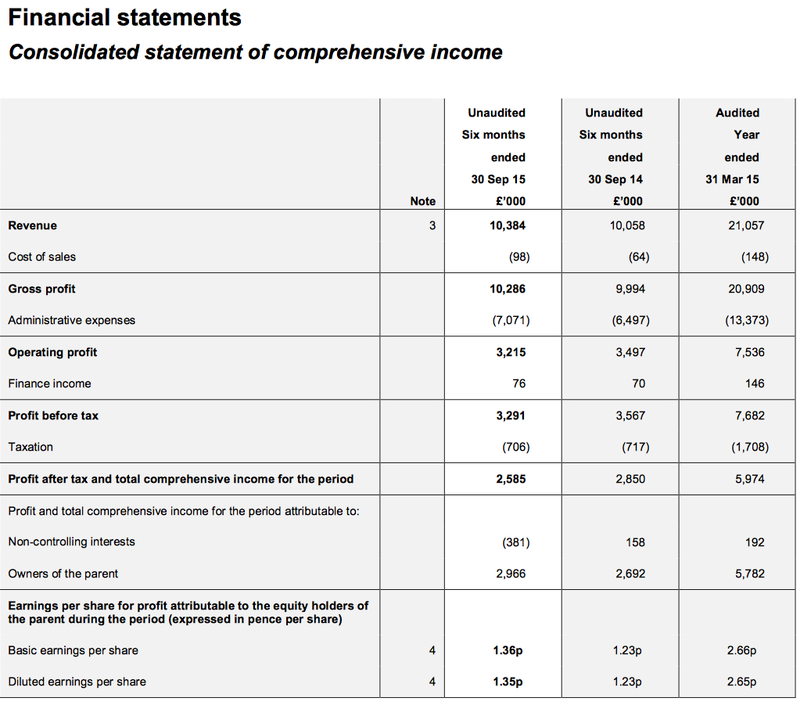 Meanwhile, REC’s anticipated 1.65p per share dividend supports a 5.5% income. All told, the ratings do not look expensive… but I would prefer to invest at the current price only if there were tangible signs of new client wins. * Next update — ex-div 3 December, 0.825p per share dividend paid 23 December, a Q3 update on 22 January 2016. Disclosure: Maynard owns shares in Record. This entry was posted in My Shares, Record and tagged REC, Record on November 24, 2015 by Maynard Paton. 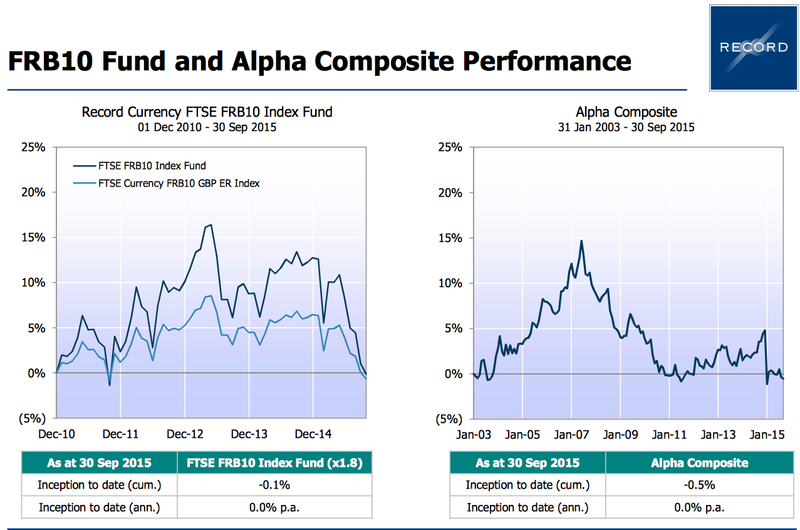 Thanks for the blog – reviewing your analysis always makes for an educational read! Four directors (including the CEO and the FD) spent just over £180K between them. Thanks for the reply and I am glad you find my Blog useful. 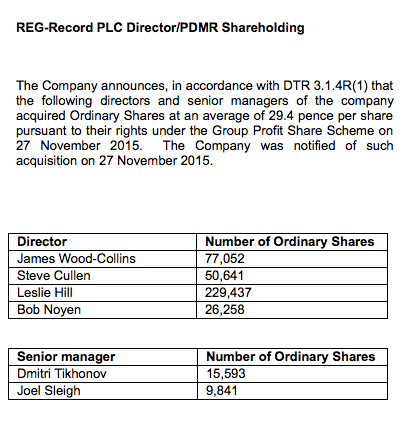 So these are not pure director purchases, but it is nevertheless useful that the directors have to place not insignificant sums into the shares every six months. I trust that will help motivate the directors to locate new company clients!